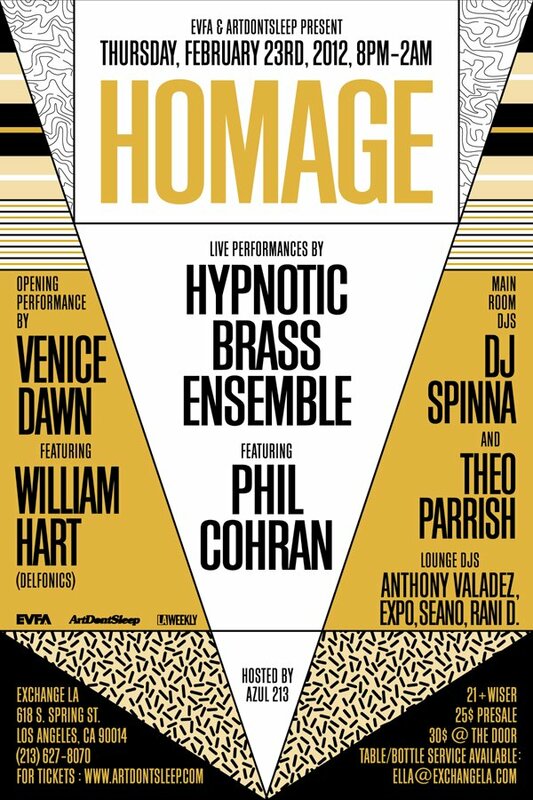 HOMAGE: Hypnotic Brass Ensemble, Phil Cohran, Venice Dawn, William Hart, Dj Spinna 2/23 L.A.! Anthony Valadez, Expo, Seano, Rani D.
Kelan Phil Cohran was born in Oxford, Mississippi on May 8, 1927. He is a jazz musician, musicologist, composer, instrument designer, holistic health advocate, and community activist. He is known most for his Affro-Arts Theater, Artistic Heritage Ensemble, trumpet contributions in the Sun Ra Arkestra in Chicago (1959-1961), and as one of the cofounders of the AACM. Cohran (pronounced “co-RAHN”), was born in 1927 and grew up outside of Oxford, Mississippi in an area known to this day as “Coontown.” The family moved to St. Louis when he was about ten. In 1958 Cohran joined Sun Ra’s Arkestra in Chicago and became a lifelong devotee of the charismatic, eccentric bandleader who was either from Birmingham or Saturn, depending on who you asked. 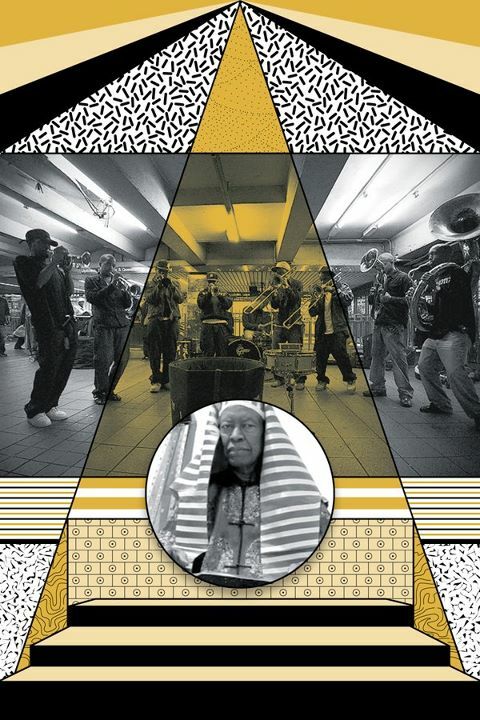 Cohran played cornet on some of the Arkestra’s greatest records, including Interstellar Low Ways and Fate in a Pleasant Mood, and became so entangled in Sun Ra’s strict regimen of practice, performance, and inculcation with esoteric ideas that he lost his wife and job. Cohran decided to stay in Chicago when the band moved to New York in 1961. In 2008, Adrian Younge, founder of The Venice Dawn, would find himself at the center of the Black Dynamite zeitgeist. Instrumental in the film’s development, Younge not only edited the film, but also composed the original score, which was hailed as a modern blaxploitation masterpiece for authentically capturing the cinematic soul of the 1970’s, from Isaac Hayes to Curtis Mayfield. Adrian Younge solidified himself as a force to be reckoned with and soon went to work writing music for the forthcoming Black Dynamite cartoon series on Adult Swim. The new LP, titled Something About April, is a heavy, dark mix of psychedelic soul and cinematic instrumentals with hip-hop aesthetics, touching on influences from Morricone to Otis Redding. Younge is currently writing and recording material for his next project, a Delfonics album with William Hart, founding singer of the legendary soul group. William Hart, among the first purveyors of the smooth, orchestral sound that would come to typify Philadelphia soul, The Delfonics established themselves as one of the quintessential soul groups of the late 60’s and 70’s and created some of the most notable songs of that era. Formed in the early 1960’s in Philly by brothers William “Poogie” and Wilbert Hart and schoolmate Randy Cain, the Delfonics established a reputation as a solid young vocal group and William Hart as a fine young songwriter. They hit both the Pop and Soul top five in 1968 with the Bell/William Hart composition “La La Means I Love You,” a now-classic soul ballad highlighted by Hart’s plaintive falsetto lead. More hits followed over the next few years, including the memorable “Ready Or Not Here I Come,” “You Got Yours And I’ll Get Mine” and their other top ten Pop hit, “Didn’t (I Blow Your Mind This Time),” which won the 1970 Grammy Award for Best R&B Performance. Turning heads throughout the industry, DJ Spinna’s sonics soon infiltrated numerous genres. Tapped by everyone from George Michael to Mary J. Blige to Motown Records (for his brilliant Michael Jackson homage to “We’re Almost There”). It’s here his production presence would flourish greatly, as Spinna would go on to revive and revise Soulful marvels like Donald Byrd, Eddie Kendricks, Betty Carter, Roy Ayers and Al Jarreau. Visit New York City any given month and find a number of Spinna themed throw-downs in the city’s esteemed venues – each as memorable as the last. As one the most important tastemakers Europe has to offer, and affiliated with labels Brownswood, Blue Note, !K7 Records and Jazzy Sport, this bearded early riser is consistently a couple steps ahead of your average early adopter. As a leading dj on Belgium’s foremost national radio station Studio Brussel he’s received compliments from Rough Trade Shops and Gilles Peterson. His passion for jazz resulted in a remix album for Blue Note which was well received by the community. Lefto is forever moving forward but always has an ear in the past. Famed for his gloriously eclectic DJ sets, he switches effortlessly between hip hop, funk, breaks, neck-snapping beats, future bass, South-American influences, bruk riddims and some wild African rhythms. He’s not only a deejay and producer but also curates his own stage at the Dour Festival and his own nights in Gent in collaboration with Democrazy. 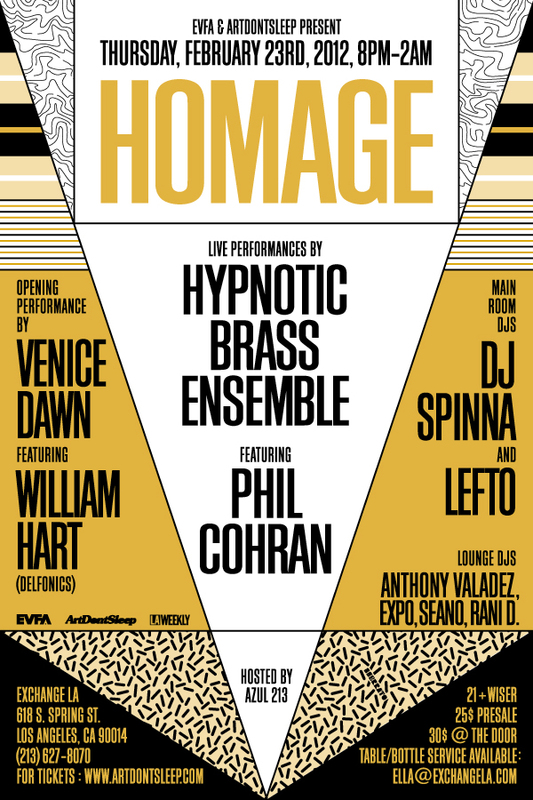 This entry was posted in Events, Fresh, Hip Hop, Inspiration, Live, LivePerformances and tagged DJ SPINNA, HOMAGE: Hypnotic Brass Ensemble, Lefto, Phil Cohran, Venice Dawn, William Hart. Bookmark the permalink.